Gratefulness and thankfulness are words that signify a consciousness of and an appreciation for the things that we have in life. Experiencing and expressing gratefulness is not always easy and for good reasons. For those of us who have experienced loss and trauma, holidays can serve as a difficult reminder of where we have been and who we might be missing. Before one can attempt to practice gratitude in the face of adverse memories and experiences, it is essential to seek help and support as we come to terms with our heartache. In my work with depression and anxiety, I find that helping families understand and validate each other’s experiences is essential to moving forward. Even as feelings of loss, hurt and sorrow are acknowledged, a focus on gratitude for the truly wonderful things in life can also serve as a source of healing. In fact, practicing appreciation can be more beneficial than most of us have ever imagined. Researchers have long known that the conscious act of being thankful can be tremendously helpful to our health and wellbeing. A study at the University of California Davis asked undergraduate students to write down five things they were grateful for in life. A control group of students did not write a gratitude list. Researchers found that participants who simply wrote a gratitude list reported a higher level of satisfaction with their lives and more optimism about the future when compared to those who did not write a list. The participants in the “gratitude” group also reported fewer symptoms of physical distress and even exercised more than the “non-gratitude” group. It seems the small act of being mindful of what we appreciate about our life can truly impact the way we live it. A recent meta-analysis looked at several major studies which examined how gratitude is linked with other prosocial attributes. Prosocial attributes were defined as qualities which helped an individual to be more connected to their social environment in a positive and helpful manner. The personality trait of being grateful was consistently found to be associated with other traits like sympathetic, hopeful, and helpful. It seems that the more we practice gratitude, the more we become grateful. The more grateful we become the more likely we are to contribute to the world around us in a thoughtful manner. Create a Grateful Jar: Place a jar or box somewhere in your home for the entire month of November. Before Thanksgiving dinner, everyone in the family must write down something they appreciate about every member of the family. “I like how Bobby always shares his toys with me.” Or “I appreciate Suzie’s singing.” Younger children can even draw pictures that they can explain at the dinner table. Expressions of appreciation which also compliment specific individuals will have the added benefit of enhancing self-esteem and improving family relationships. Everyone benefits from positivity, why not make a point of developing and expressing it? Create a Grateful Table: Use a paper tablecloth which can double as a canvas and allow children to color pictures of what they are thankful for and adults to jot down their own gratitude lists. 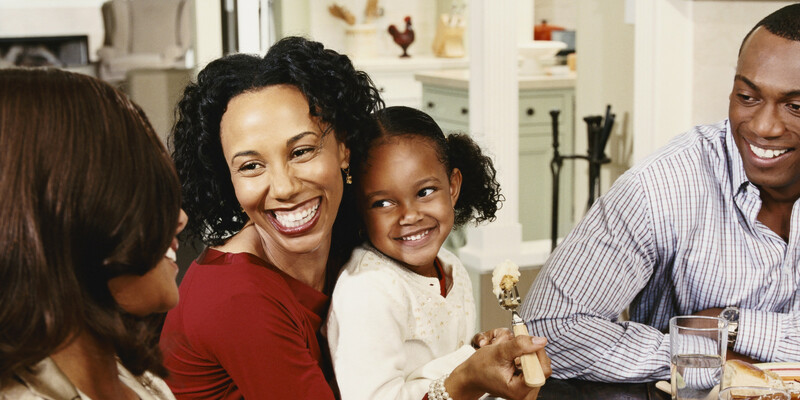 Family members can add and share throughout Thanksgiving dinner. This is a nice activity that can keep small children focused and entertained and keep adults focused on the things we can agree on rather than the things we don’t, i.e. politics. Keeping previous tablecloths to share each year can also serve as a great reminder of the past and create a family tradition for years to come. Volunteer for Gratitude: Giving back to those who are less fortunate is a great way to feel purposeful and to acknowledge the blessings we are likely to look over most days. Volunteering at a homeless shelter or nursing home can be a bonding activity that also serves to remind families of what they have, and shift focus from what we may be missing to what we already possess. Feeling overwhelmed by food preparation? Become reminded that at least you have food to eat. Feeling frustrated with family members? Remember the joy of having a family at all. Suddenly it seems we all have a lot to be grateful for! The art of appreciation is not about ignoring pain and hardship or disregarding the struggles of our past. It’s about embracing that sadness while also incorporating thankfulness into our consciousness. It’s about making an effort to shift our thoughts and therefore shift our emotions. We can have some control over how we feel, and that’s something to be thankful for. Ma, Lawrence and Tunney, Richard J. and Ferguson, Eamonn (2017) Does gratitude enhance prosociality: a meta-analytic review. Psychological Bulletin, 143 (6). pp. 601-635. ISSN 1939-1455.